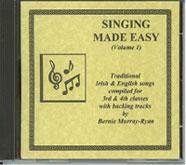 For the celebration of the 10th year in business, all the manuals and CDs in the Singing Made Easy range are being sold for half the price. This A5 size book contains lyrics (only) for all the songs listed below and could be a handy resource to have in a classroom. This manual contains the melody line, tonic solfa, lyrics and guitar chords for each of the songs listed below.